It’s getting close to the summer, but the temperature has already been hitting the high 80s and 90s in Austin. 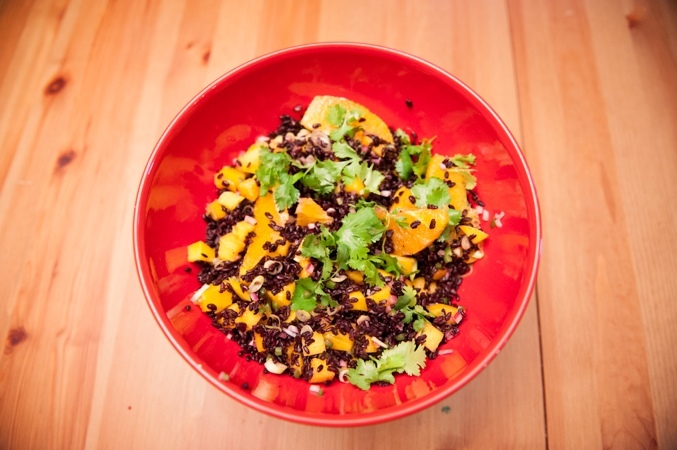 Summer also means many fruits and vegetables coming in to season. Peaches usually come into season between May and July, depending on the variety. Because of the unusually warm winter for us this year, our Central Market was already carrying locally grown peaches. For our Tuesday dinner, I wanted to make something special since Mark was having a big meeting at work. 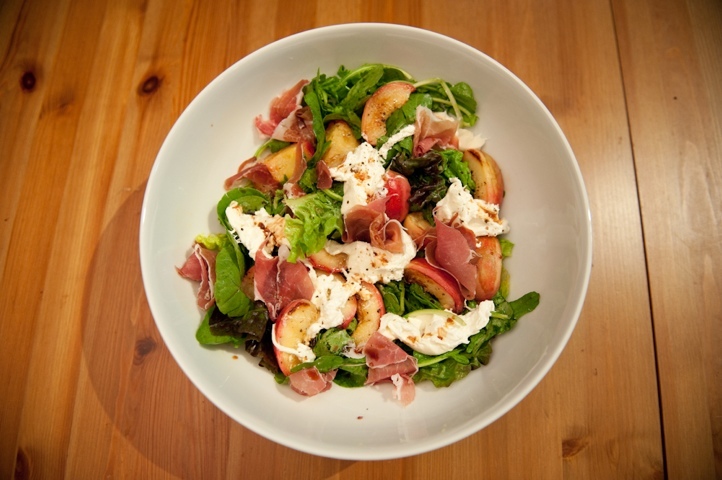 I started with a very simple peach, Burrata and Proscuitto salad with arugula. The recipe I found actually called for apricots, but those were not yet in season enough to be carried at Central Market, so I used peaches instead. 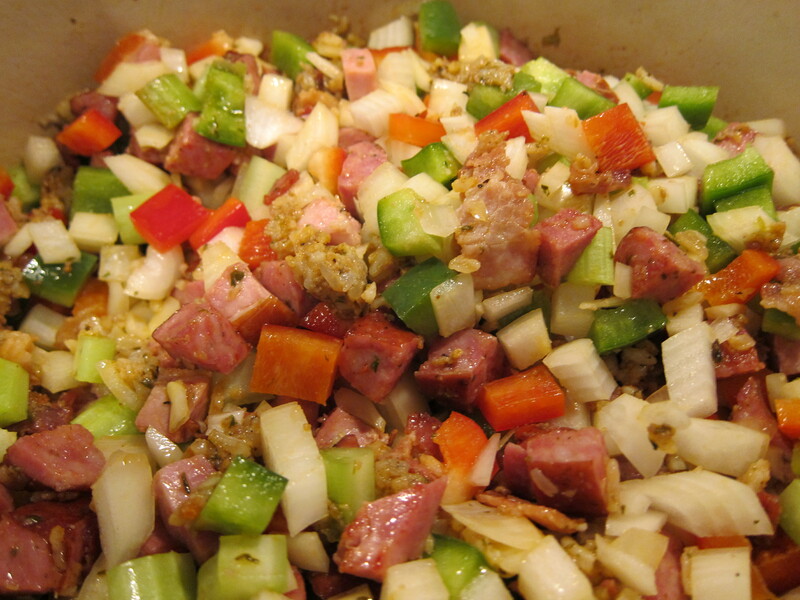 I also substituted Proscuitto for the country ham since I love Proscuitto. 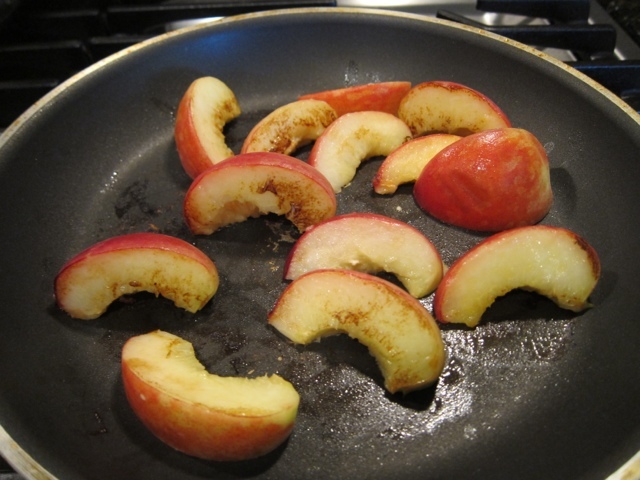 Instead of grilling the peaches, I brushed them with mesquite smoked olive oil, and charred them in a stove top pan on high heat. 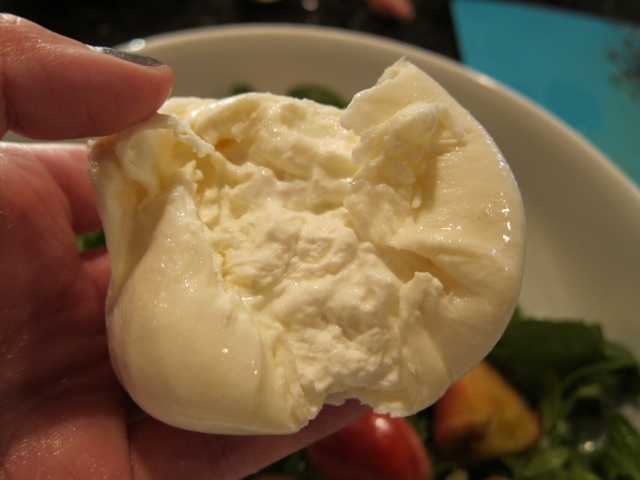 Burrata is a fresh Italian mozzarella cheese made from cream and mozzarella. The cheese has a harder exterior like mozzarella, but when you break into the center is soft and creamy. 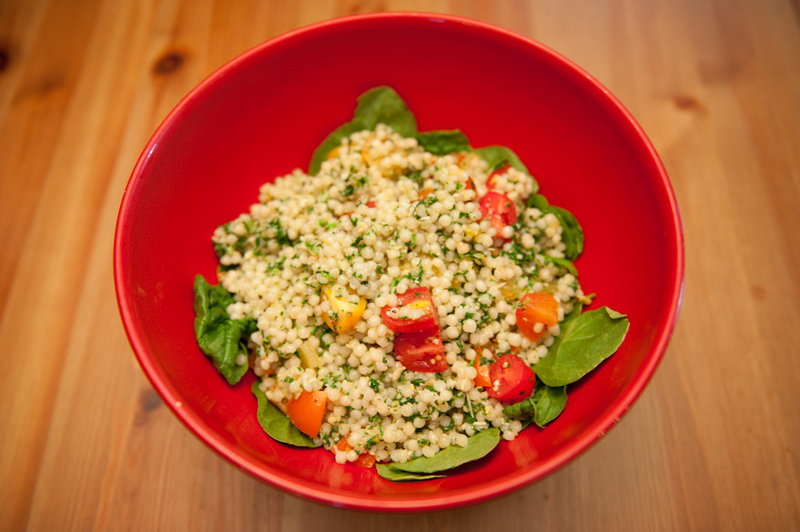 To assemble the salad, a mixture of lemon juice and olive oil is whisked together in a large bowl, and seasoned with salt and pepper. 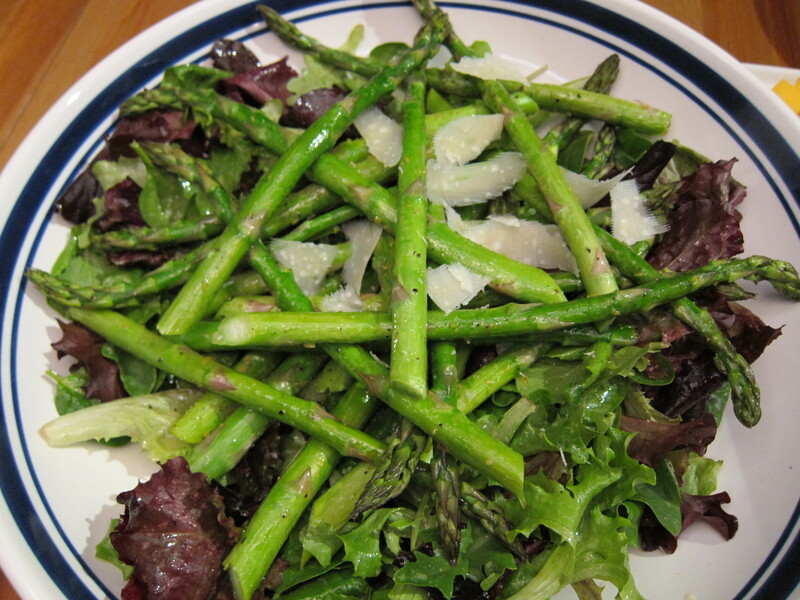 The arugula and any other greens are tossed in the oil and lemon juice dressing. 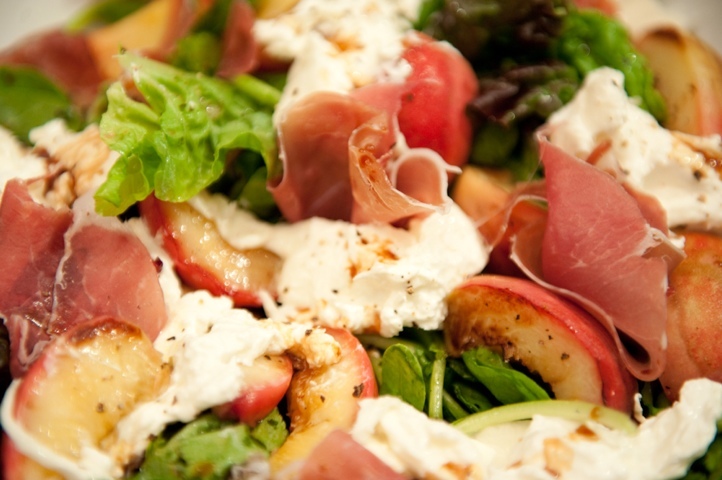 The greens are transferred to a serving bowl, with torn pieces of Burrata, Proscuitto, and charred pieces of peaches are tossed in. 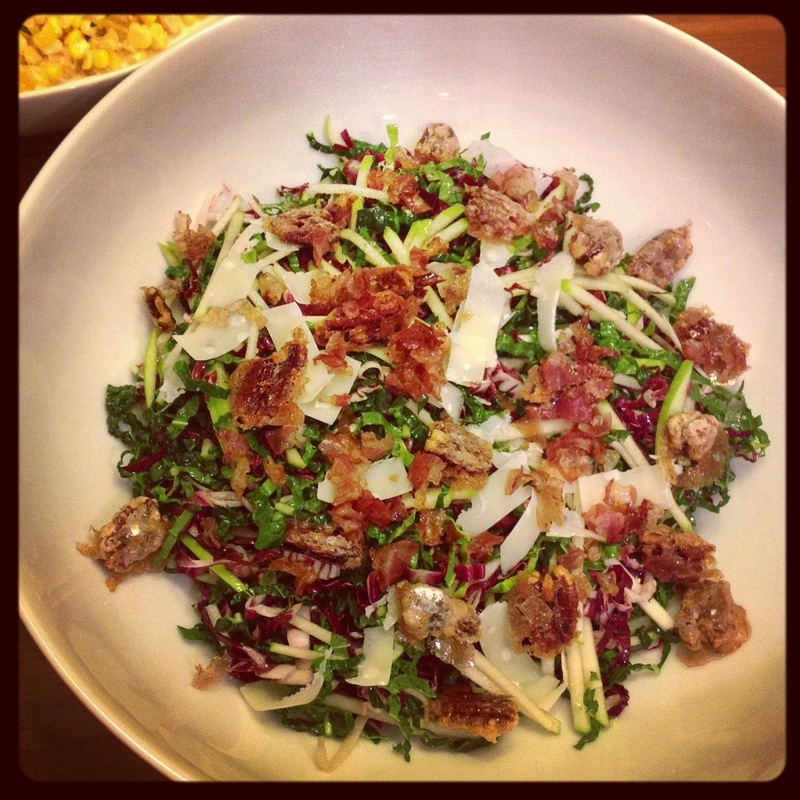 The salad is drizzled with aged balsamic vinegar and it’s ready to be served. One of my best friends from my teenage years was visiting Austin with her BF and we had a little dinner party to celebrate. My parents loves to throw dinner parties as well, and they always had a seafood dish, a poultry dish, and a red meat dish. This is also a rule that I adhere to most of my dinner parties. I composed the menu last week, and here is what I came up with. The menu goes from light dishes to heavy dishes, and I decided to cook and serve each course as the dinner went on, instead of doing it family style like I usually do where everything is served at the same time. 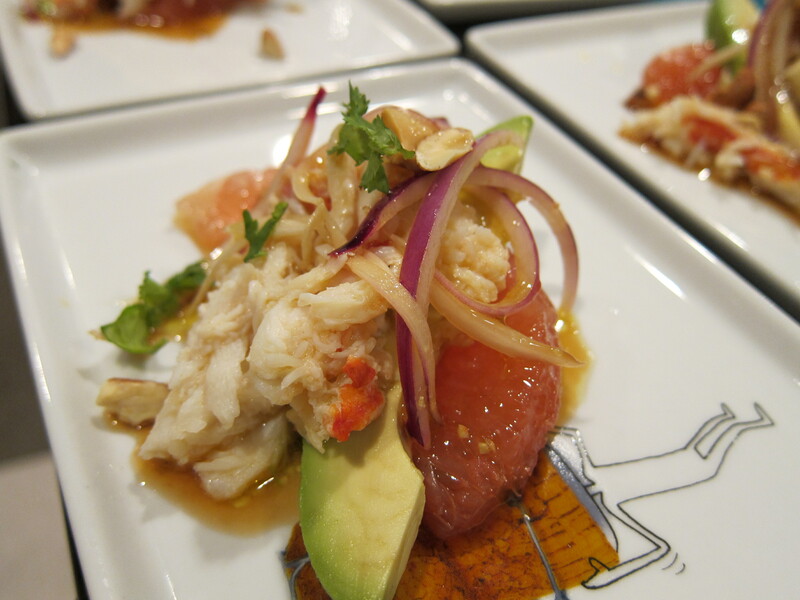 For the salad course, I chose a crab, grapefruit and avocado recipe I tried a few months ago, and I substituted snow crab legs for the king crabs that the recipe called for. 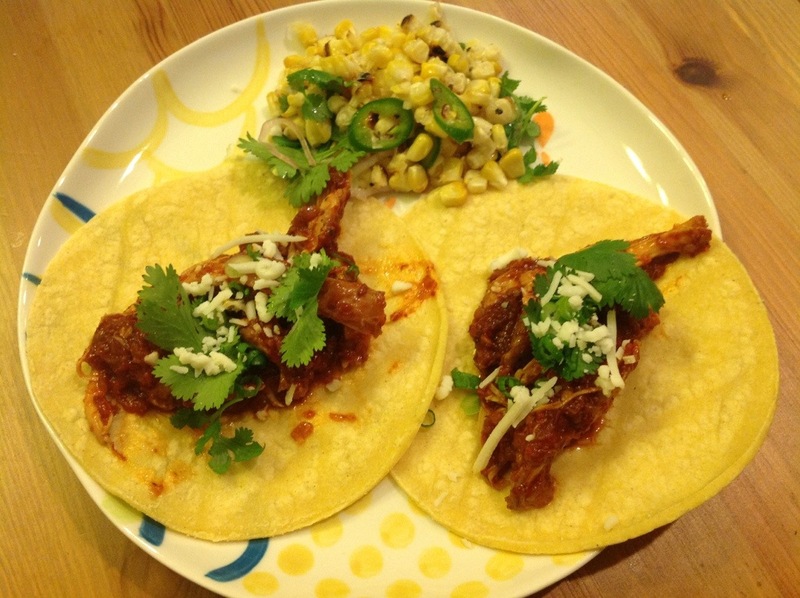 This recipe is very quick and easy, which is another reason I picked it. 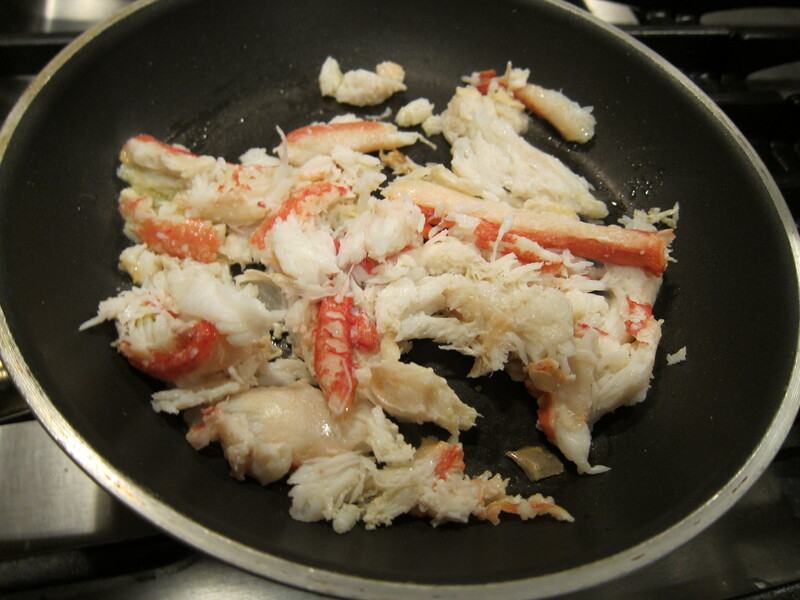 The crab meat are picked clean from their shells, and quickly seared in a hot pan for about 30 seconds until heated through. 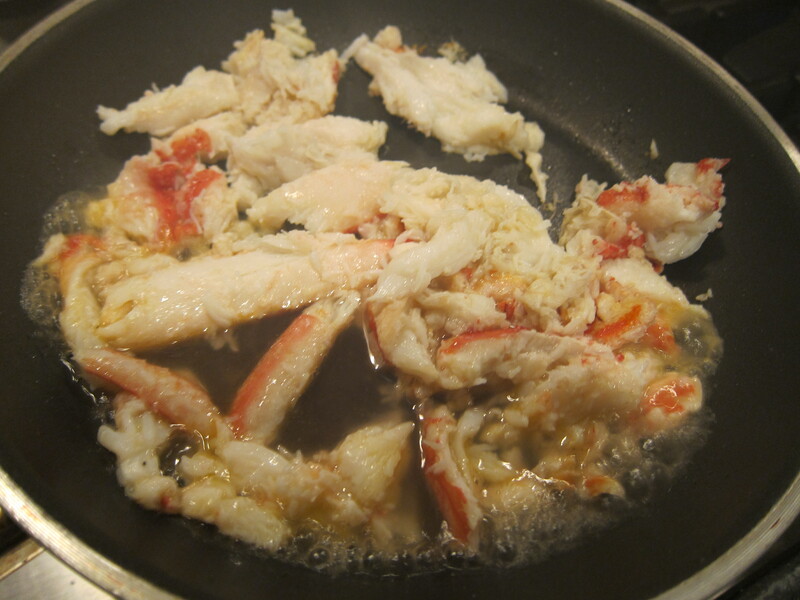 Then fresh squeezed grapefruit juice is added to the pan to deglaze and cooked for a few minutes until the crab meat is caramelized. 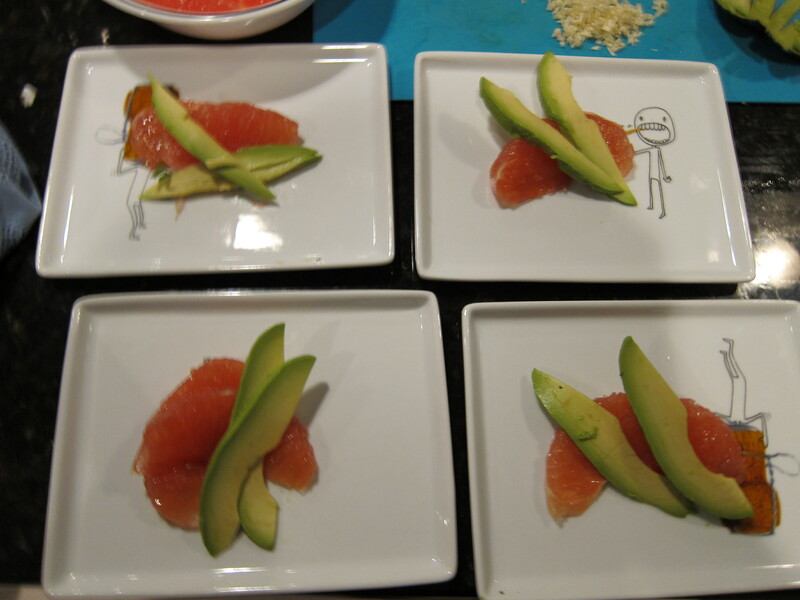 To assemble the dish, slices of grapefruit and avocados are arranged on a plate. 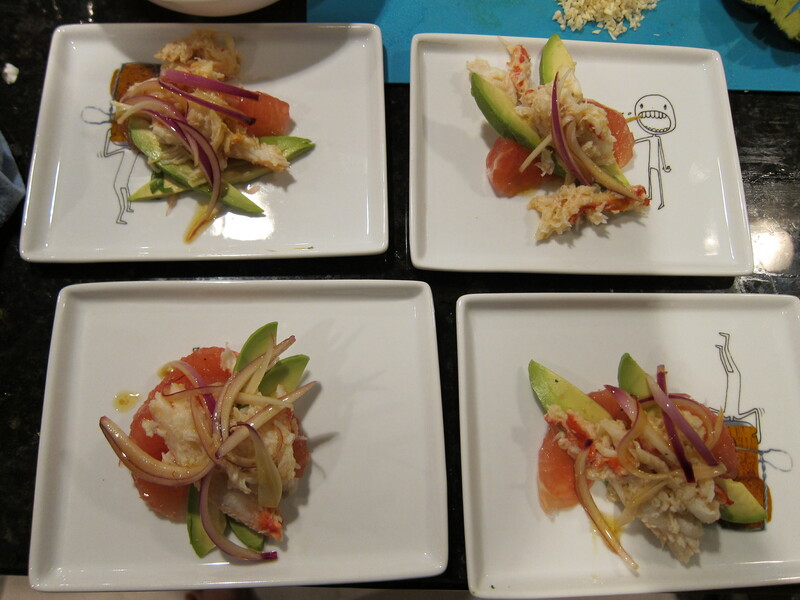 Then the crab meat is arranged over the fruits, and topped with red onions that has been marinaded in a mixture of olive oil, grapefruit juice, and soysauce. 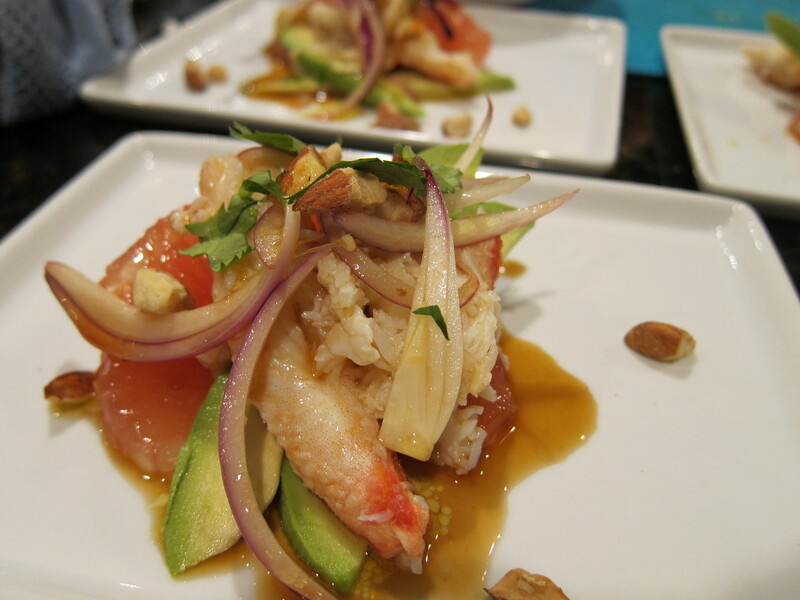 The salad is finished off by drizzling extra dressing on top of the crab and fruits, and sprinkled with crushed roasted almonds and fresh cilantro leaves. This was a great light start to a 6 course meal, and I love the way the creamy avocado, crunchy almonds, and the juicy grapefruit textures and flavours play together. At a dinner party recently, a guest mentioned that their date was someone who was a non-dairy vegan… I got this message 1 hour before the start of the dinner party, and I was scrambling to figure out a plan, until I realized that two dishes that I had planned were already Vegan. This does changes my perception of vegan cooking since I’ve always thought that it would be super hard to eat and make vegan dishes. It was then that I was conscious of the fact that a lot of my favourite dishes are already vegan. 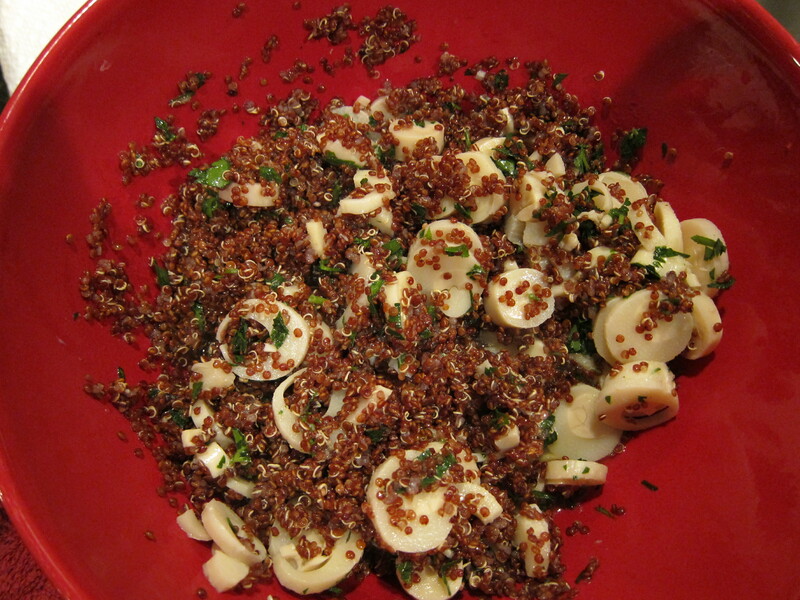 One of the two vegan dishes that I unknowingly made is one of my favourite salads. 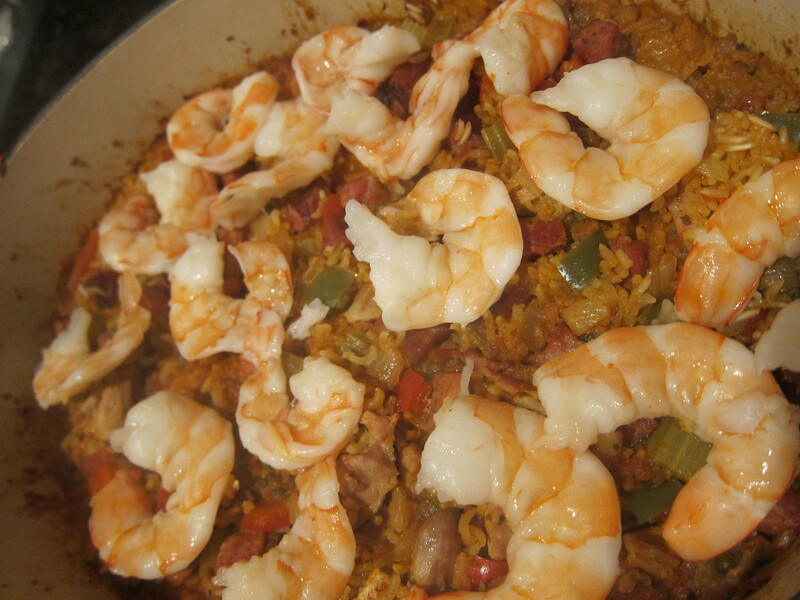 I found this recipe about a year ago, I had thought that the flavor combination sounded interesting, and when I actually made the dish I absolutely loved it. 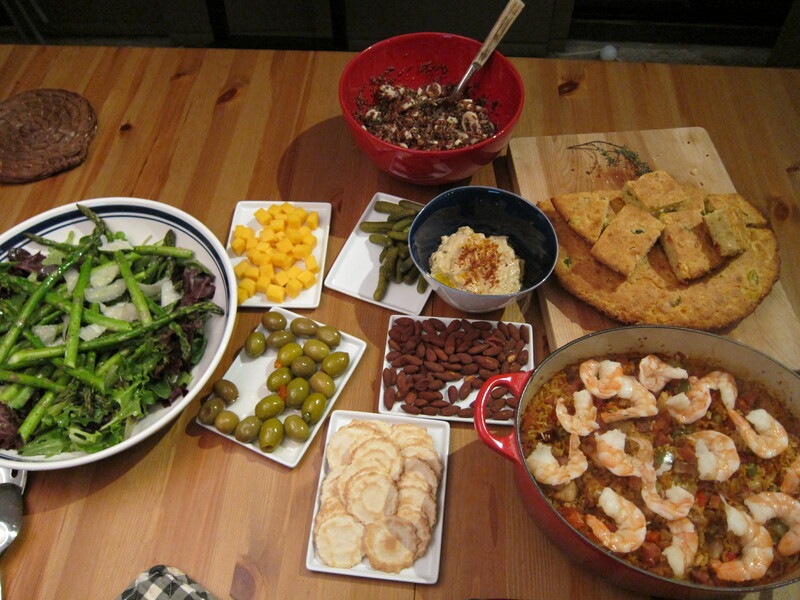 When I was planning this dinner party, I decided to make it again, and after finding out about the vegan guest, I was very relieved with that decision. 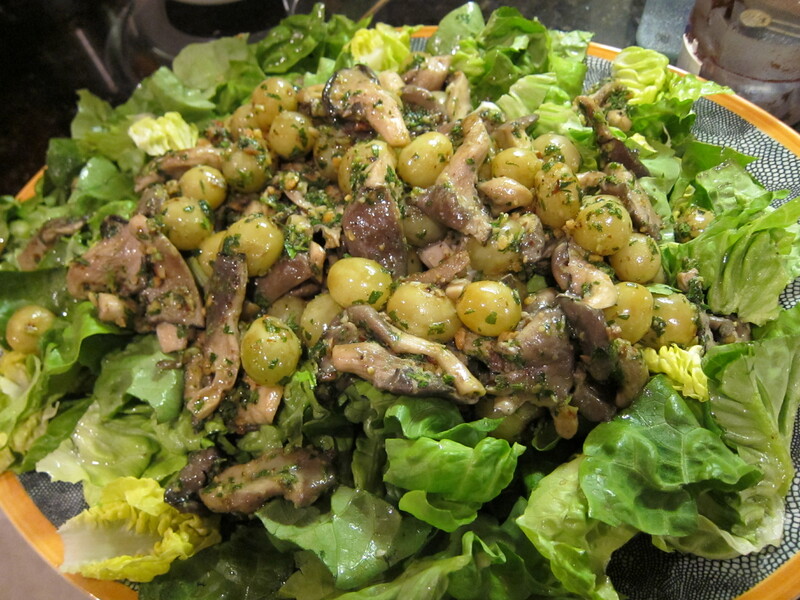 The dish is a salad composed of sliced celery and bibb lettuce tossed in a celery seed based salad dressing, and the greens are topped with a pan roasted grapes and oyster mushroom salad, which are tossed in a almond and parsley pesto. The recipe calls for actual grilled grapes and mushrooms, but I just pan roasted both the grapes and the mushrooms because it’s easier. 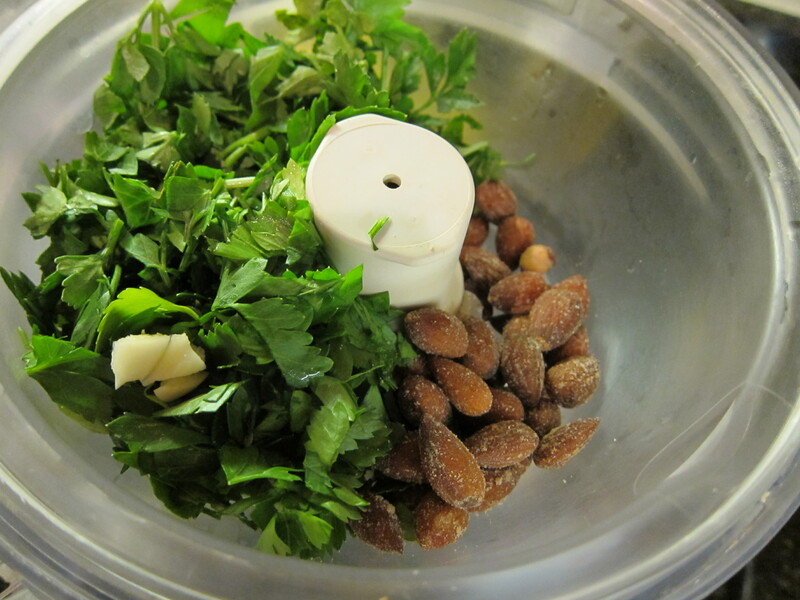 The best part of the salad is the savory roasted almond, parsley, and celery leaf pesto. When you buy a head of celery, sometimes there are some left over leaves on the outer stalks, and most of the times there are a lot of younger, almost light yellow leaves at the center of the head. 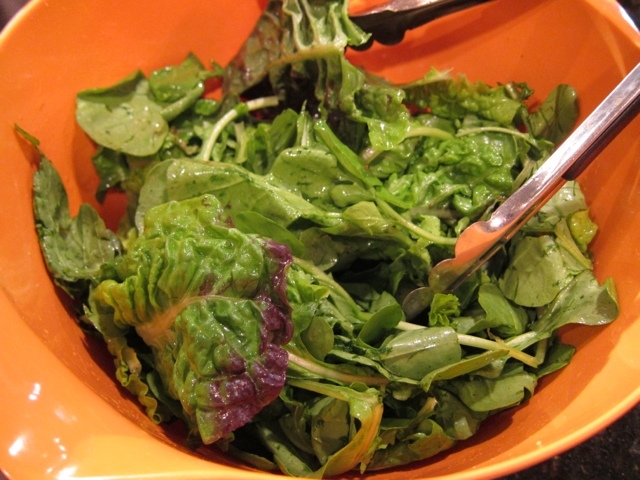 These leaves adds an additional level of celery flavor to go with the celery seed dressing for the greens. 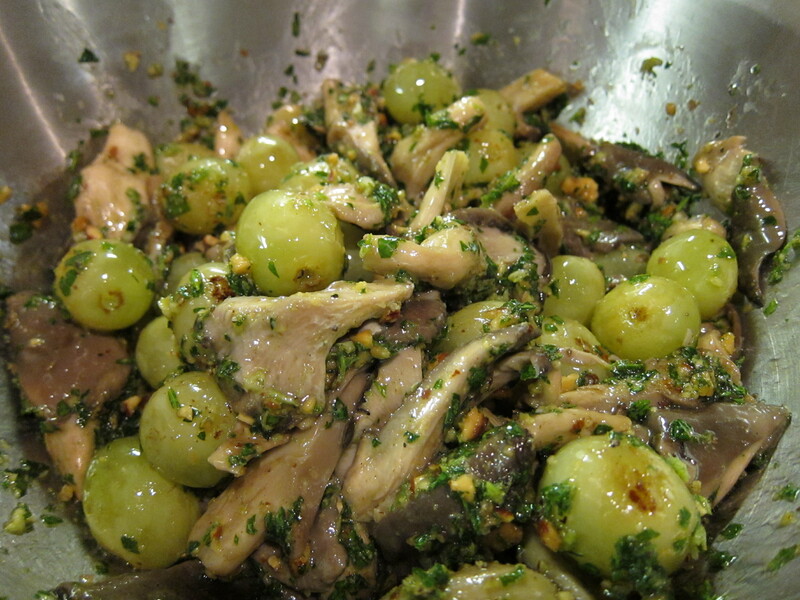 The grapes and the mushrooms are tossed in the pesto. The salad is tossed in the dressing, laid over a large plate, and the roasted vegetables in their pesto are spread over the greens. 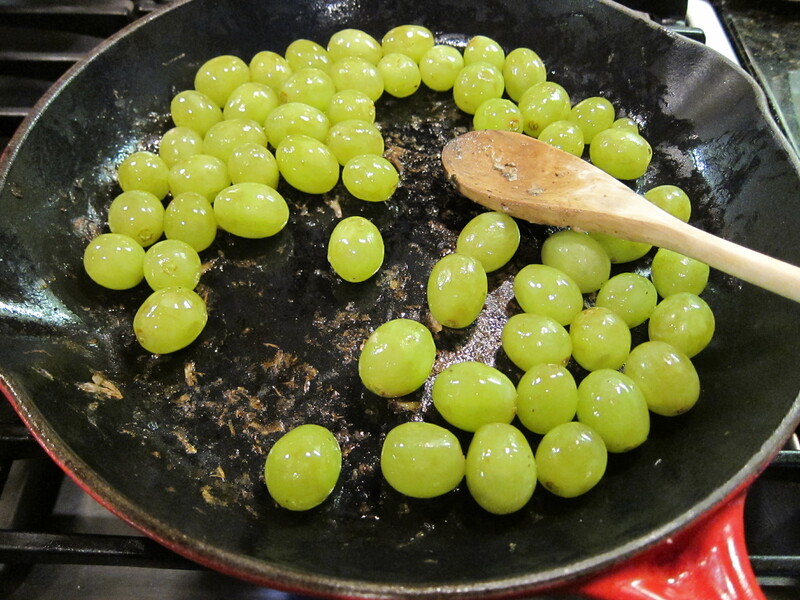 The roasted grapes lends an unexpected burst of sweetness that really elevates the flavors in the salad. 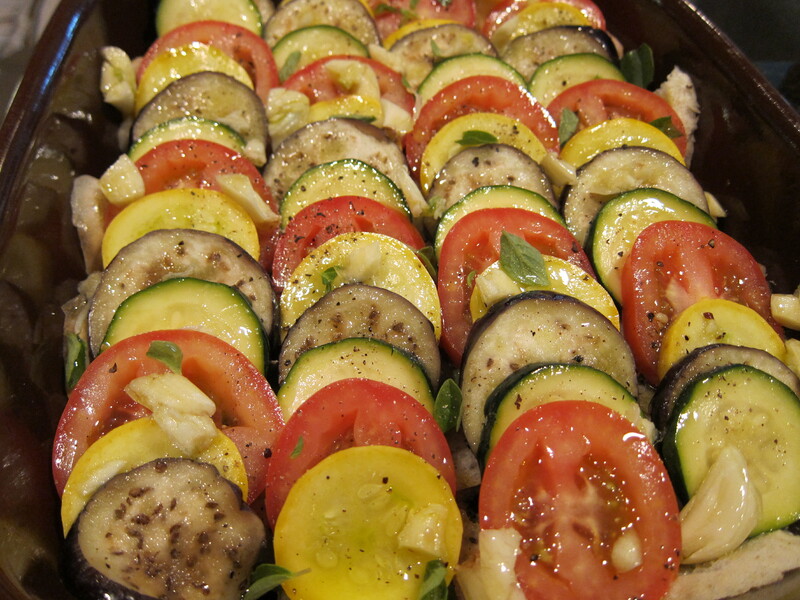 The other “accidental” vegan dish is a tomato, zucchini, squash, and eggplant bread gratin. 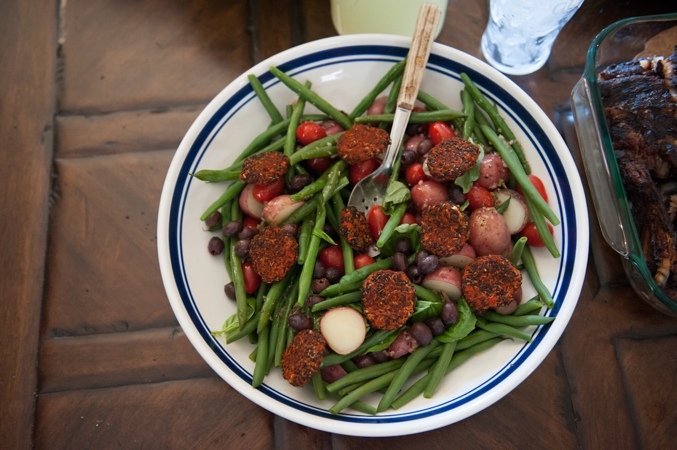 This dish is simple, delicious, and so pretty! 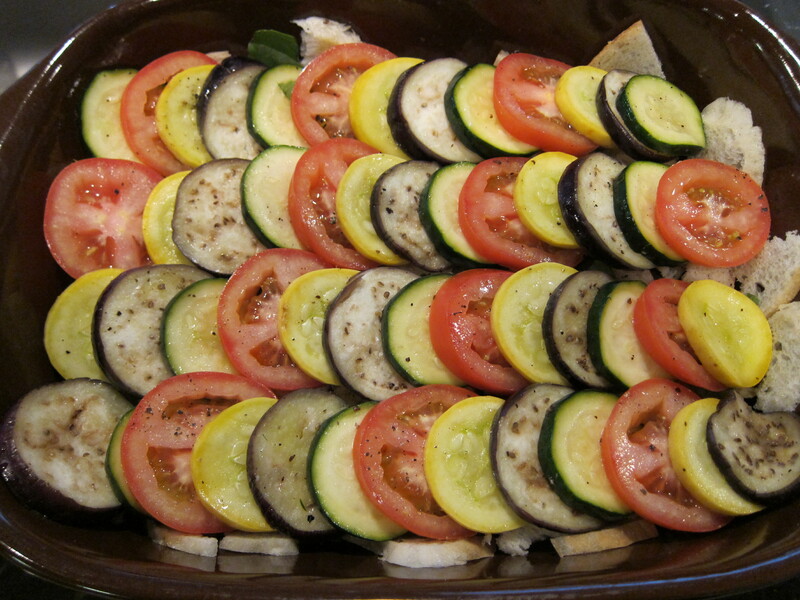 The recipe called for zucchinis only, but I decided to add another color to the dish by adding squash. Also instead of regular eggplant, I used Japanese eggplant, which has about the same circumference as the squash and the zucchini. 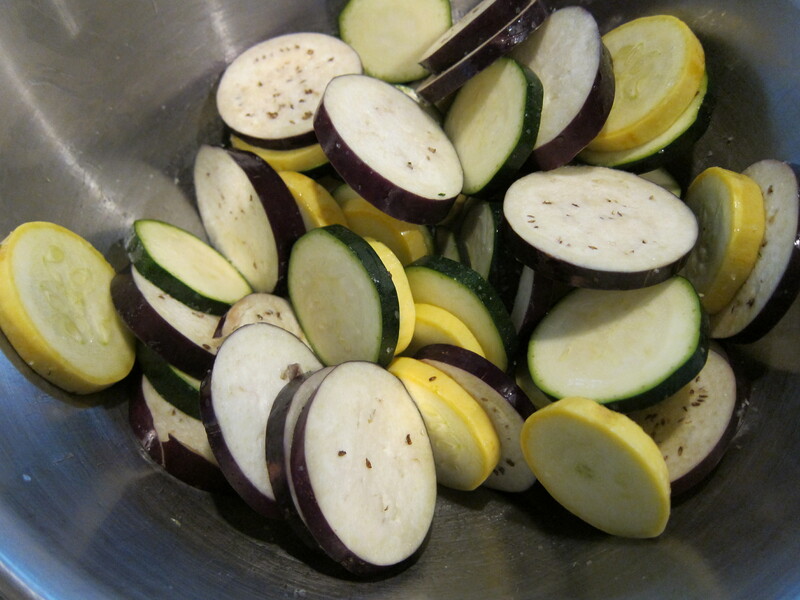 To make the gratin, the eggplant, zucchini and squash are sliced to 1/4 inch thick, tossed in salt, and set aside for 10-20 minutes. 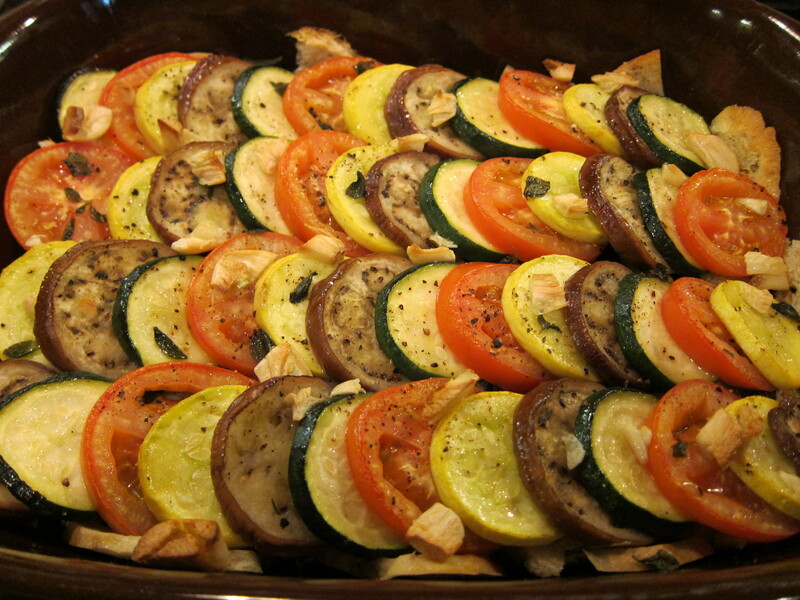 This step is important because the salt draws out excess liquid from these vegetables, and because you will be baking this gratin, if the vegetables are baked as is, it will make the dish too soggy. 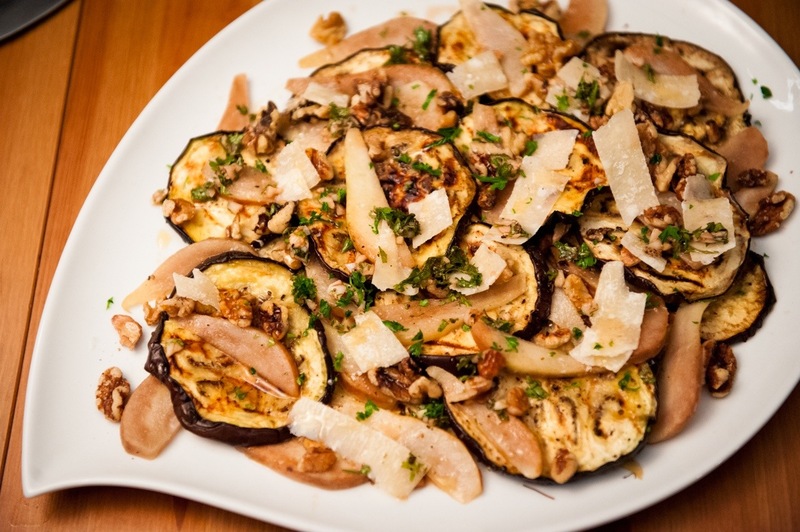 After about 20 minutes, you’ll notice that the vegetables, especially the eggplant, will have lost a lot of their moisture, and have become more pliable. At this point you want to drain the vegetables and pat them dry with paper towels, and they will be ready for use. 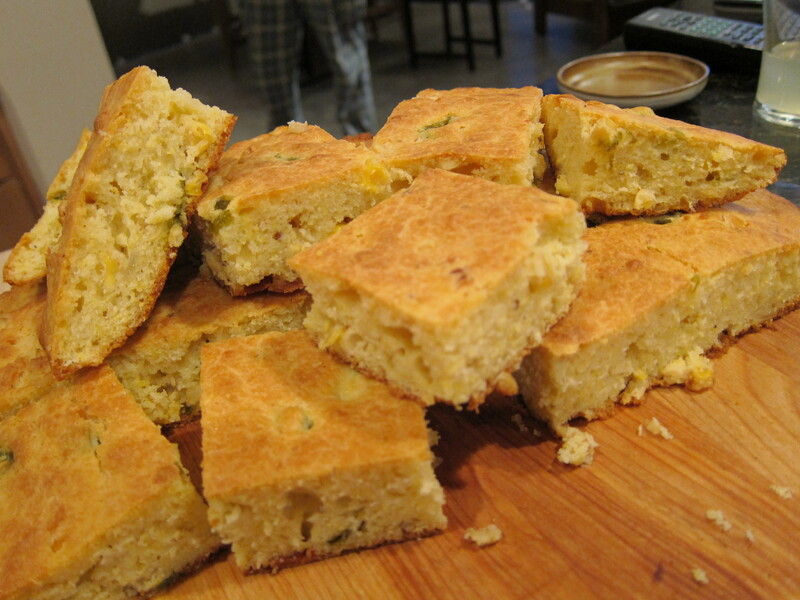 To assemble, some bread pieces are torn and spread on the bottom of a baking dish. 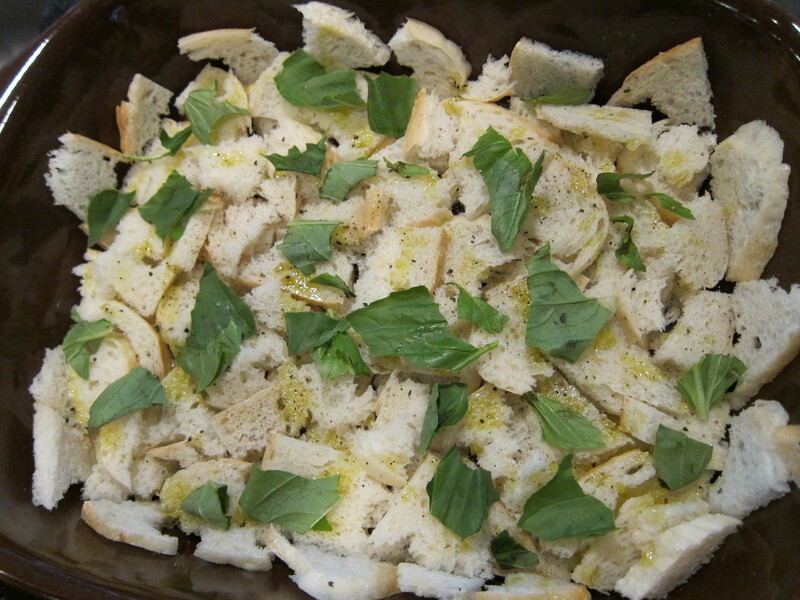 Then some olive oil is drizzled on top and torn pieces of basil leaves are sprinkled on top of the bread. 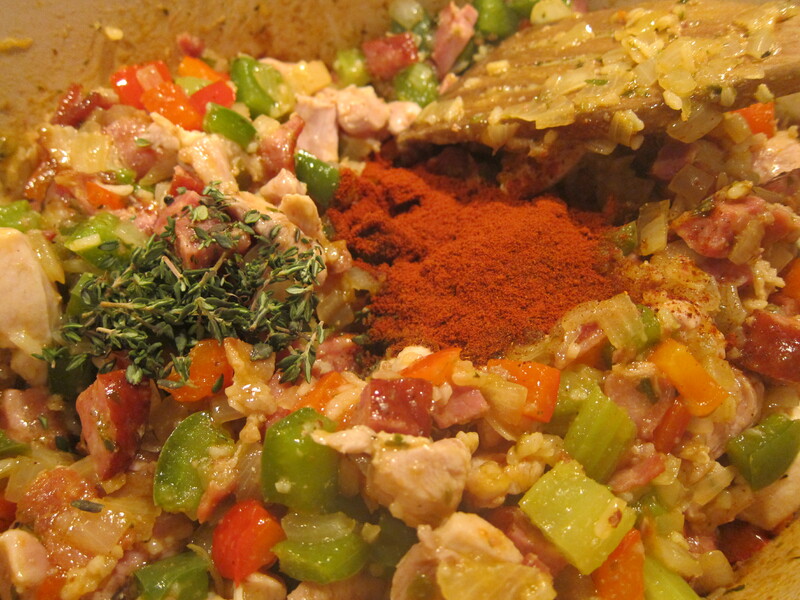 Next the vegetables, along with sliced tomatoes, are placed, over lapping each other, on top of the bread. You can be as creative as you want with the patterning. The vegetables are drizzled with olive oil, seasoned with some salt and pepper, and sprinkled with crushed garlic and fresh oregano. The dish is baked in the oven until the bread is brown on the bottom. 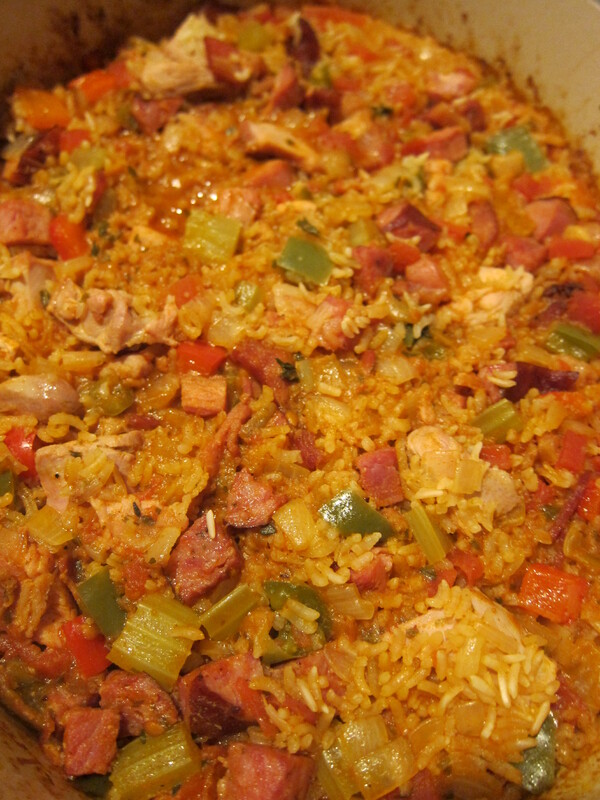 The finished product is crispy on the bottom and tender on the top. The vegetables are given a chance to show case their natural flavors, with a little enhancement from the olive oil, salt and pepper.